I have to say that this has been my experience with the French people in my family. My father was emotional, brash and demanding, but at the same time filled with a natural grace that had been bred into him by his Catholic parents. Now, one of my daughters is living with a Quebecois whom she cannot understand. He is again, emotional, brash and demanding. They have a beautiful new daughter. She has made herself known plainly and loudly and is there miles ahead of you, like her father. I look forward to knowing her. All that being said, I have found that many people have the same ancestors as I coming from France to Quebec at it’s founding. Most of them have copied a family tree put on Ancestry by some well meaning individual, the veracity of which is slightly questionable. I was like them, initially delighted to find it. But going back through it, things became increasingly more difficult. My main focus is always on BMD (birth, marriage and death) records because they are the most reliable. That is an easy way to keep the line correct. Of course, by the time you hit the 1600’s overseas, it becomes harder to find those records. For this family, that is, the Beauchamp family of La Rochelle, France, the verifiable records almost seem to start in Canada where our good friend, Father Tanguay recorded the genealogies of early French Canadian families in “La Dictionnaire Tanguay”. From there you get a lead on the parents overseas where you have to know where to look. Things get a bit sticky when you look for the birth of Michel, the father of the two Canadian boys, Jacques and Jean. The record on Ancestry comes from a Dutch website of contributed family trees, no idea where the information came from. Nothing on Familysearch. Basically, going further back there is nothing too solid at all. The name changes to Deschamps and goes back to Olivier who was born in Brittany. But there are not verifiable links coming up in time from there. You could be looking at years of research. One of the worst links is that of “Inconnu Marguerite Collineau de Montequerre” and Marc Beauchamp. That woman has been written about all over the net with some saying just dismiss the name altogether because there is some confusion over the place name and the surname. I had to look up “inconnu” because I am not fluent in French to find that it means “unknown”. Anyway, you see where I am going with this? Other people’s trees can cause a lot of difficulty. I don’t like using them except to see if they have come up with some reliable sources. That being said, you can still tell a lot about the people by the few records there are and the history of the place. If Olivier (b.1534) is part of that family I would like to know why they migrated south from Brittany to Nantieul since the Bretons are known for maintaining there own culture. 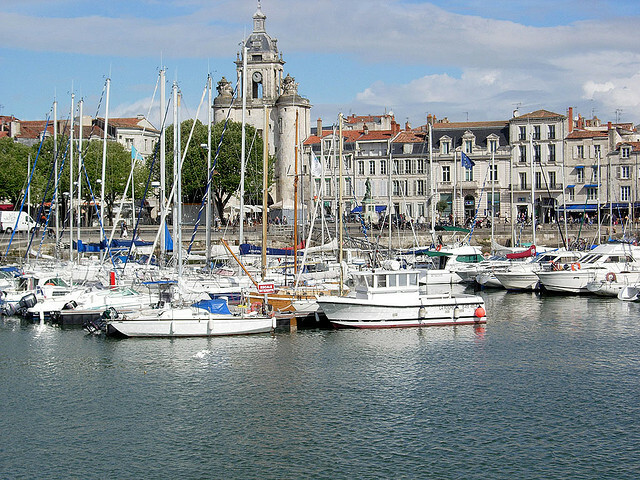 Here’s a photo of La Rochelle, a beautiful place, just to make you feel better. This entry was posted in Jacques Beauchamp, Jean Beauchamp, Researching and tagged Beauchamp, France, Jacques Beauchamp, Jean Beauchamp by Shamwest. Bookmark the permalink. Thanks for visiting Jackie. I have sent you an email.